This is Bio-Technology project report on "comparative biochemical study on precursor and differentiated hematopoietic cells in rat". In this report, after carrying out several experimentation, comparison of the antioxidant enzymes in precursor cells of bone marrow and the differentiated neutrophils and platelets is demonstrated. You can also Subscribe to FINAL YEAR PROJECT'S by Email for more such projects and seminar. Free radicals are atoms (e.g. oxygen, nitrogen) which are generally formed by the hetrolytic cleaveage reasulting with at least one unpaired electron in the outermost shell, and are capable of independent existence. A free radical is easily formed when a covalent bond between entities is broken and one electron remains with each newly formed atom. Since ROS and RNS play a role in cellular proliferation and differentiation during hematopoiesis, aim of this study is to compare the level of antioxidant enzymes in the precursor cells of bone marrow and the differentiated cell of blood. All blood cells arise from a type of cell called the hematopoietic stem cell (HSC). Stem cells are cells that can differentiate into other cell types; they are self-renewing—they maintain their population level by cell division. The cellular oxygen & nitrogen oxidants called reactive oxygen species (ROS) & reactive nitrogen species (RNS) are generally synthesized by the blood cells as a part of defense mechanism, are constantly produced in animal and human cells. 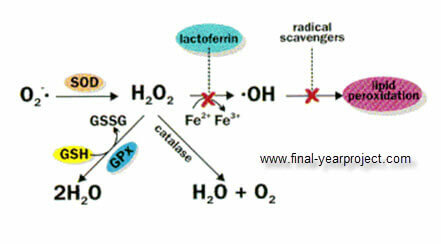 Large amount of formation of these reactive species can lead oxidative damage in cell constituents instead of clearing the invader cells/foreign cells and promote a number of fatal diseases and aging. Cellular antioxidants protect against the damaging effects of ROS. ROS are essential mediators of antimicrobial phagocytosis, detoxification reactions carried out by the cytochrome P-450 complex, cellular differentiation and apoptosis which eliminates cancerous and other life-threatening cells This effect of ROS is dose dependent. Thus endogenous antioxidants do not completely remove ROS in animal and human cells. This report also discuss methods and material for this study. Use this report for your reference and study work.